A Royal Wedding was not on our calendars two years ago when Victoria Lyras was in midst of developing the program for a 2018 debut season for Indianapolis Ballet. Yet here it is, a most timely salute to nuptials on stage at The Toby at Newfields in the heart of Indianapolis. Coincidence or not, what is noteworthy, a dozen years ago when Lyras founded the Indianapolis School of Ballet as a forerunner to a professional company, thoughtful programming has been central. Pieces are chosen to show connecting threads, the depth and breadth of which we are free to integrate on our own terms. At the final dress rehearsal on May 17, with my mind tuned to the upcoming May 19 events at Windsor for Harry and Meghan, I was nudged to look beyond ceremony as I experienced the luscious Grand Pas De Diex from the closing of Don Quixote and the sparkling Midsummer Night’s Dream opening sequence; and from the couplings leaping out of the trajectory in Eclat! to something deeper. Love, of course, is at the heart. Yet, the depth that unfolds in all three took me on a journey from personal to universal, and back again, against a backdrop of specific times, and timelessness, both in the midst of human events where reality and fantasy, desires and thwarting, play out on world, as well as theatrical, stages. For me, interfacing ballets derived from the works of Cervantes and Shakespeare—literary contemporaries who died within a day of each other in 1616—is contextually significant. In Balanchine’s benchmark "101 Stories of the Great Ballets," Don Quixote and The Dream appear back-to-back. Not merely as a coincidence of alphabetizing, in my mind, but as a reminder that connections exist and alertness to them enriches art and life. That’s where location enters. How do we place a place on a bare stage? The spray of lines projected as a backdrop image created by lighting designer James Leitner and the steel gray leotards [Lyras’ costume design] give Eclat! a feel of now and here. Without a tinge of of prompting, the immediacy of Spain is upon me with the vibrant crimson and gold suit and dress and brilliant sunny lighting for the Grand Pas de Deux. And even before the curtain went up, I knew I was in a magical place when Sprites and Bugs fluttered up and down the aisles at the start of Act II for Dream. Indeed, when the curtains parted, an overhang of trees was enough to fully transport me. Lighting that took me into night time and the costuming delineated between mortals and fairies. This said, spectacle was but one part of what delighted me, sitting in an audience full of children and their families invited to attend as part of the outreach plan of Indianapolis Ballet. It’s the discernible musicality, clarity and precision, thoughtfulness and delight that already is marking the aesthetic core of Indianapolis Ballet. "Eclat!" is thrilling with the zest of speed and constantly evolving imagery of multiple solo moments projecting out of a corps, along with daring duets by two sets of couples. Everyone is precisely on mark with Lyras’ choreography, perfectly matched to the virtuosic demands of the 3rd Movement of Prokofiev’s Piano Concerto #3. Applause was enthusiastic for Company members Camila Ferrera, Jessica Miller, Katherine Sewicki, Mary Ann Schaefer, Glenn Kelich and Kris Santos. And Apprentices Rowan Allegra, Abigail Biller, Abigail-Rose Crowell, Sierra Levin, Sarah Marsoobian and Loretta Williams. Yoshiko Kamiskusa and Christopher Lingner are nothing short of thrilling in the Grand Pas de Deux. They relate to each other through body language that exudes joyfulness. They have connected their personalities with the original Petipa choreography and Ludwig Minkus’ score, not so much saying, ‘look at us’ as they are inviting— celebrate with us and be happy. The expected leaps, turns and lifts are more than met. When Lingner precisely arches his back in a fingertip touch, it is done to delight his beloved; and when Kamikusa puts space between her fingertip and his, poises one-legged on point, unassisted, it is done to assure him it’s a lasting love. We know. We smile. Lyras’ choreography for The Dream creates a sense of community—and humor, and honesty in the mishaps. Yes, Shea Johnson commands with elegance as Oberon; Kristin Young Toner stands her ground as Titania; Christopher Lingner scurries with vigor as Puck—but they do so within the context of magic tempered by good heartedness. When Mary Ann Schaefer as Hermia and Glen Kelich as Lysander enter the forest, we know they are in love. When Jessica Miller as Helena and Kris Santos enter, we know something’s amiss. And when Puck comes upon them and later upon Andrew Phillips as Bottom the Weaver, Paul Vitali as Quince the Carpenter, and Drew Lybolt-Wagner as Starveling the Tailor, we’re primed for mischief. As for The Page, played here with a set mind by Jacqueline Killian, and over whom Oberon and Titania quarrel, we take sides and hope for the best. The foursome of lovers and trio of rustics who wander into the forest may be confounded by the magic, but it is clear to the audience what is transpiring because the entire cast is expert with mime and a sense of movement that conveys emotion and gives dimension to their character. The Sprites, Fairies and Bugs each assume personalities whose reactions to events heighten our own amusement and deepen our understanding of how inter relationships and events affect us. When next Indianapolis Ballet announces a program, we’re more likely to want to attend because we remember how joyful we felt at that time and in that place. 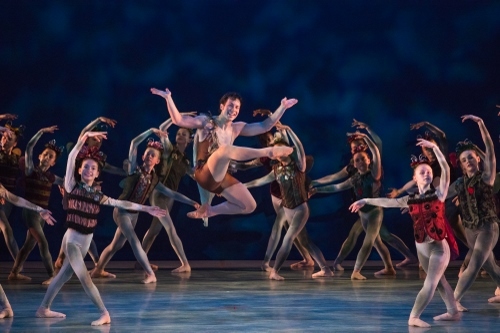 Indianapolis Ballet Founding Company member Chris Lingner performs as the mischievous Puck during IB’s May residency production of "A Midsummer Night’s Dream" at The Toby at Newfields. 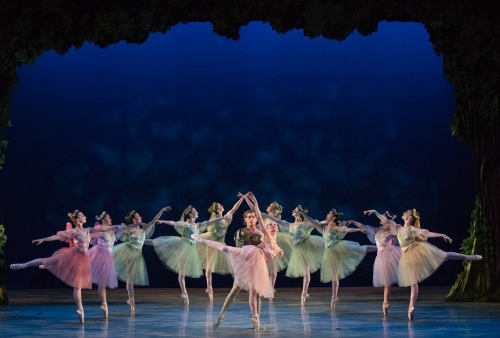 Shea Johnson and Kristin Young Toner starred as Oberon and Titania - King and Queen of the Fairies, respectively - in Indianapolis Ballet’s May residency production of "A Midsummer Night’s Dream," which closed out the company’s 2018 debut season at The Toby at Newfields. The premiere of "Éclat!," a new work choreographed by Indianapolis Ballet founding artistic director Victoria Lyras, brought new life to Prokofiev’s Piano Concerto No. 3 while highlighting many of the company members during an energetic opener to IB’s May residency.